Over 1000 Weight Watchers Items for Sale! Guess what? It's American Chocolate Week! (Which you may have already guessed if you read the title of this news item.) This special celebration of chocolate doesn't mean you should throw caution to the wind and gobble up pounds of the stuff, but you can indulge wisely. As you probably know, chocolate is mood-lifting and good for your heart (especially dark chocolate). Pssst -- here's a sneak peek at Hungry Girl's special Vitalicious Chocolate week offer. It's the perfect way to celebrate American Chocolate Week, and if you use promo code "guiltfree" -- you'll get free shipping on this sampler pack! 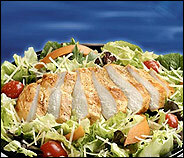 Fresh New Mickey D's Salads on the Way! McDonald's Tries to Get Healthy...Again! 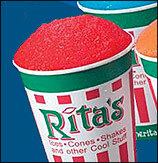 Rita's, the country's largest Italian ice chain, will celebrate the first day of Spring by giving out free ices on Sunday, March 20th. They're fat free but high in sugar -- so get the sugar free ones if she's offering those! ***Holy Mackerel...A new study showed that eating fish makes people happier. Apparently the Omega-3 fatty acids found in most seafood helps people feel less depressed. ***Hardy-har-heart! Another new study has found that laughter is good for the heart. It relaxes blood vessels and boosts blood flow. ***Good news for fans of whole grains. The Whole Grains Council says it is introducing "Good source" stamps that will let consumers know if products are good sources of, excellent sources of, or made entirely of whole grains! A slew of companies have already signed on to use these seals -- including Kashi, Roman Meal and Bruegger's Bagels. ***That's all we've got...HG Out!